Alicia Jacobs and a fellow resident of the Altgeld Gardens public housing development on the South Side pose during a successful protest of a local food store. Photo by Alicia Jacobs. This is a story of a protest that helped a community. Could you imagine being outside for more than nine hours a day in dangerously cold temperatures, standing up and fighting for a change? Could you be a part of a boycott, just like your older relatives have done in the civil rights days? Occupy Altgeld is a group of concerned residents who live in the Altgeld Gardens public housing development on the far South Side who decided to address problems that many residents saw but couldn’t seem to change on their own. 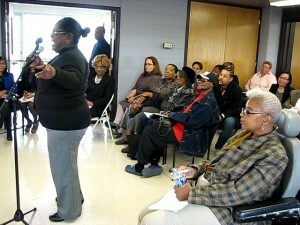 These residents felt the food prices of Rosebud Farm were too high. Rosebud Farm is the only grocery store in the area surrounding Altgeld where residents can purchase food. Step through this door to visit Altgeld Gardens’ new farmers market. Photo by Manquaze Allen. 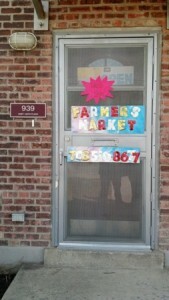 Marguerite Jacobs is the founder of Altgeld Gardens’ new farmers market located at 939 East 130th Place. Mrs. Jacobs, who happens to be my mother, gets her fresh produce and supplies from Pembroke, Illinois. Vegetables, peanuts and fruit are sold at the market for a low price. The food is freshly grown, so there are no chemicals in her vegetables and fruit. Here are a few items that Mrs. Jacobs sells: potatoes, onions, peppers, oranges, carrots and much more. “Altgeld is a food dessert community. I feel that the younger kids are exposed to so much fat foods and not enough healthy products. 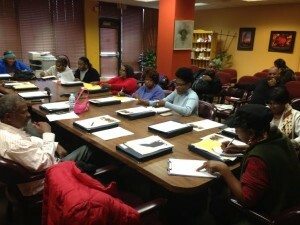 The farmers market will give the kids good choices to eat,” said Mrs. Jacobs. She spent much of the time preparing to open the market at Altgeld in June of 2012. Now she is selling her produce and in 10 months her goal is to start selling meat. Tenants of public housing have said throughout the Plan for Transformation that they see very little police activity in their areas, except during drug raids. In decades past, police officers used to walk the beat, but they are little seen these days, and the public housing tenants living in CHA developments and in areas where they relocated wonder where “Officer Friendly” is, especially in light of the fact that the Chicago Housing Authority has been paying the Chicago Police Department millions of dollars annually to provide foot and car patrols. 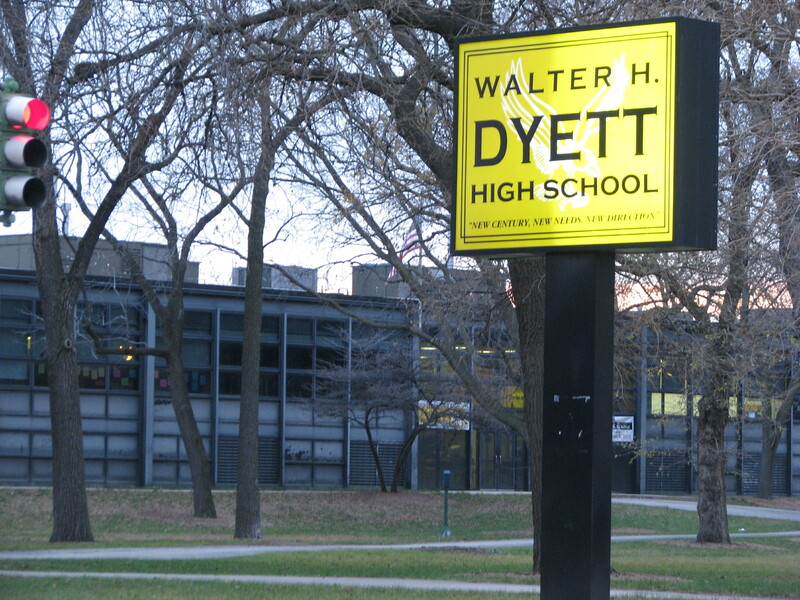 Walter H Dyett High School, 555 E. 51st St., which is slated to be closed under a new plan announced by the Chicago Public Schools. Photo by Mary C. Piemonte. A South Side community group “fed up” with the Chicago Public Schools closing and turn-around process in low-income areas of color brought their protest to Mayor Rahm Emanuel’s office this week. “CPS’ top-down school actions in North Kenwood and the Greater Bronzeville community have caused spikes in violence and destabilized schools, and not improved student outcomes,” reads a statement from the Kenwood Oakland Community Organization, also known as KOCO. 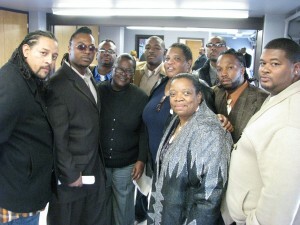 KOCO members, along with parents from North Kenwood, Oakland and Bronzeville neighborhoods, rallied outside Emanuel’s office on December 1, and called on him to partner with them to implement “The Bronzeville Global Achievers Village,” an alternative school transformation plan they’ve developed over the past 18 months. KOCO member Shannon Bennett told Residents’ Journal shortly after the protest that members from his organization and several community parents, along with representatives from the Centers for New Horizons and the Grand Boulevard Federation, first met with CPS CEO Jean-Claude Brizard at their office on November 21 regarding KOCO’s plan to counteract CPS policies concerning school closings, phase-outs and turnarounds. Brizard said he would get back to them but did not, according to Bennett. “So that’s why we have gone around him, and go to his boss,” Bennett explained. 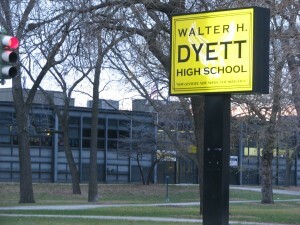 Bennett said members from KOCO delivered a letter to Emanuel through one of his staff members, and added that members of his organization are particularly upset about the phasing out of Walter H. Dyett High School, 555 E. 51st St., which KOCO noted in their press release is the only neighborhood high school in Kenwood-Oakland. Sending students to Wendell Phillips Academy High School, 244 E. Pershing Road in the Bronzeville community, will result in increased violence, he argued. In 2005, Bennett said he personally experienced a spike in crime in Kenwood-Oakland after the closing of two schools, the Jackie Robinson and Price elementary schools. There is a decades old myth that Black men just don’t want to work. But William Harper, a tenant of the Altgeld Gardens public housing development on the far South Side of the city, has many examples that dispel that myth. Harper is founder and vice president of Meyer’s Corporation, which provides general contracting services such as dry walling, painting, sub-frame, roofing, landscaping and snow removal. Harper has been in business since January 2008 in the Altgeld public housing community, he told Residents’ Journal after the Oct. 18 CHA Board of Commissioners meeting at the Vivian Gordon Senior Apartments, 4227 S. Oakenwald St. Within that last year alone, Harper said he has hired over 59 African American men ex-offenders but added that he is having a difficult time in getting paid by the CHA’s private Management Company HJ Russell for some completed work, and had to lay off some of his employees. “I was unable to keep all employed because of the lack of work I am receiving,” he said. Editor’s Note: The following article was written by a youth reporter who is a graduate of the Urban Youth International Journalism Program class at People for Community Recovery, a not-for-profit organization based in the Altgeld Gardens public housing development. After fighting for 10 months, Altgeld Gardens finally got a library. There is a door separating Carver Elementary School and the Altgeld Library. It is the first public library to share a Chicago Public Schools building. The library is located right across the street from the Larry Hawkins Chicago International Charter School (CICS) and Carver Primary Elementary school. 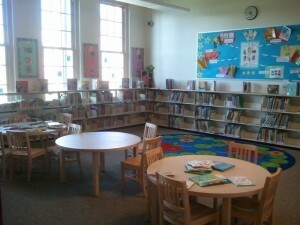 The library opened April 8, 2011; at this time, it is under-going renovation to install a central air system. The interior of the new library in the Altgeld Gardens community. Photo by Alisha Jacobs. The library has free wireless internet and 30 computer stations, 20 for children and 10 for adults. There were 25 residents in the library at the time of the RJ interview. Residents were at the computers, searching for books and checking out books. The library is a heavily utilized place in Altgeld. This July, Chicago battled extreme heat. But what exactly is a heat wave? A heat wave is caused when a large mass of hot air stays over an area. Chicago hasn’t had a heat wave advisory since 1996, when there were about 750 heat-related deaths over a period of 5 days. There are heat warnings in over 36 states, so we’re not alone. Most places have reached triple digits repeatedly, according to ABC news. The extreme heat left over 150 million people around the country trying to find relief in any place possible. Most people don’t know that elevated temperatures are a public health threat that leads to a considerable number of deaths. Every year a lot of people are hospitalized or die due to exposure to high temperatures. An average of 400 deaths are annually counted as heat-related in people who are 65 years and older. Elderly people should make sure their temperature doesn’t rise above 102 degrees, because the condition can quickly lead to heat stroke, according to USA Today. We have to make sure we keep an eye on elderly family members and friends. Seniors are more vulnerable to the heat because their body does not contain as much water as young people.